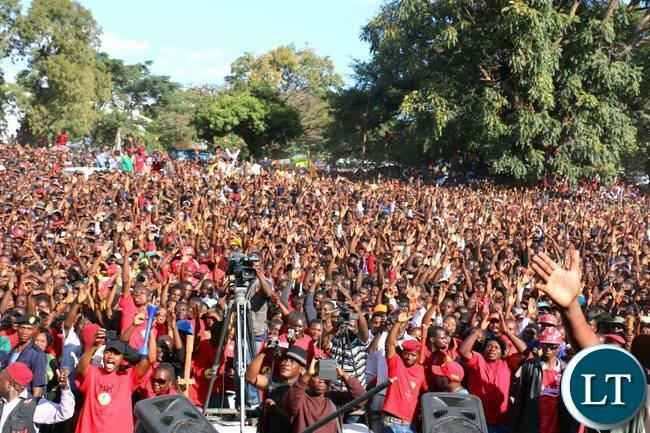 Hundreds of Copperbelt residents thronged Kitwe’s freedom park were the United Party for National Development -UPND Officially launched campaigns ahead of the August 11 general elections. 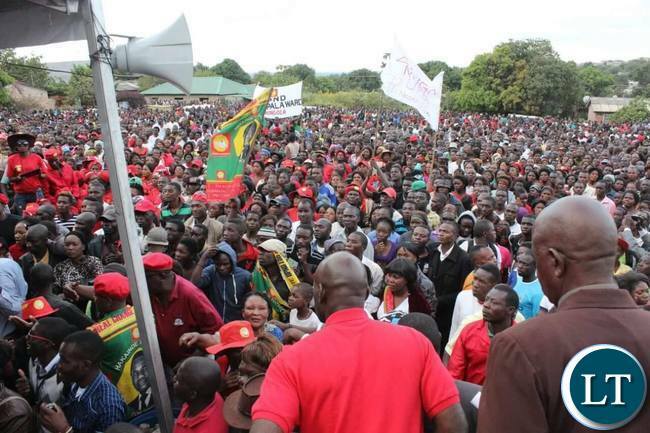 The mammoth grand rally attracted scores of cadres and residents from various towns on the Copperbelt. The rally was punctuated by solidarity songs and other entertainment provided by Musician Pilato and many others. Anderson Mazoka’s widow Mutinta was presented with a bouquet of flowers and statue while Mulenga Sata and His cousin Miles Sampa presented the Sata family during the tribute. Addressing the multitudes at the rally UPND president Hakainde Hichilema alleged that the PF has failed to manage the Country’s economy. 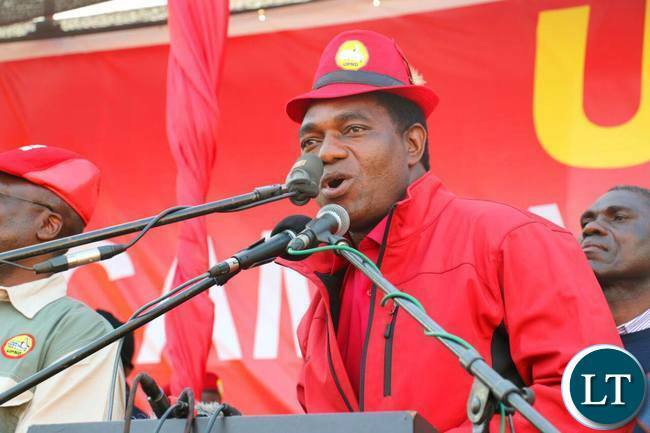 Mr Hichilema urged Copperbelt residents to give him a vote because he has an answer to the Country’s economic problems. Earlier at the same rally former Republican Vice Presidents Lupando Mwape and Guy Scott appealed to the residents to give UPND a chance. Mr Hichilema was accompanied by senior UPND officials among them Garry Kombo, Obvious Mwaliteta and Mutale Nalumango. Elsewhere campaigns have heated up with the United National Independence Party UNIP saying that they have already started their national wide campaigns. UNIP Secretary General Raphael Banda told ZNBC news that his party has so far received overwhelming response even from other political parties. And Forum for Democracy and Development -FDD says a number of rallies have been lined up in the country. FDD Spokesperson Antonio Mwanza says his party is expected to officially launch its campaigns on the 30th of this month. What is this am witnessing……. The last few pictures are different from the first ones, were they taken before all the people arrived, did you do the same for the PF. By your reporting when you say “hundreds of Copper belt residents” are you saying they were less than a thousand.One of the last pictures number 10 has GBM. Did he manage to attend the rally because other news indicated that he was being questioned by police at one of the police stations. HH also seems to be wearing different clothes in picture 2 and 7, did he change his clothes during the rally. Dr Scott also has different clothes in picture 9 when compared to other media who reported the same event today. True these pictures are choking PF to the core. PF had their mammoth rally in Lusaka also where they ferried cadres from countryside using state resources. But this UPND rally was right in PF’s bedroom & UPND does not have the financial muscle to ferry people from countrywide. Right now Kambwili is on ZNBC1 condemning GBM for promising to end load shedding in two years. This is more realistic than the failed PF 90 days promises of fixing the constitution & Economy. This election will be too tight & may be decided in round 1 especially with the unexpected choice of Inonge instead of Nawakwi or Luo as Running mate. More defections from PF are on the way. @Mushota. I am beginning to like you for telling the truth. I think Wynter will even do better in Lusaka than Lungu. No political experience…sonta apo wabomba! Am telling you HH enjoys losing….and he is losing in August..and Mulenga Sata has now regretted plus all the minions that left PF…. But still am disappointed with this man,tribal remarks manifestd in his ignorance and failure to translate the word MAIZE in BEMBA in his speech at that very rally. IT’S YOU WHO ARE BEING TRIBAL. YOU WANT EVERYONE TO SPEAK BEMBA. COPPERBELT IS LAMBA, MIND YOU. DO YOU EXPECT GBM TO SPEAK FLUENT LOZI IN MONGU. DO YOU EXPECT LUNGU TO SPEAK FLUENT LUNDA IN MWINILUNGA? DON’T TAKE US FOR FOOLS. WE WANT A LEADER WHO WILL SAVE THE COUNTRY FROM THIS INEPT, CORRUPT AND FAILED LEADERSHIP OF LUNGU. The HH tr1balist in a bloody red shirt. Tonga tonga tonga tonga, using other ttribes to win votes. FOOOOOLS……! ITS TIME TO SHOW YOU WHERE YOU BELONG? We are not interested. Is this even news? The last few pictures are different from the first ones, were they taken before all the people arrived, did you do the same for the PF. By your reporting when you say “hundreds of Copper belt residents” are you saying they were less than a thousand. One of the last pictures number 10 has GBM. Did he manage to attend the rally because other news indicated that he was being questioned by police at one of the police stations. Ignore the middle pictures. Just concetrate on pictures 1-5 & the last two. The other pictures are from Chongwe & Kafue rallies put their there just to play down the reality on the ground. 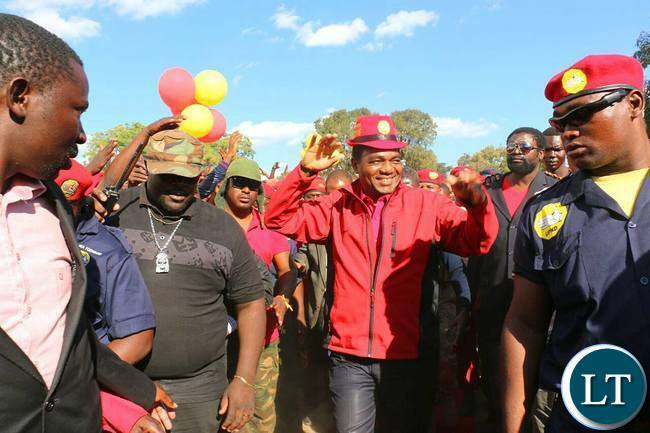 HH only wore red attire through out the rally & when did he change his shirt? They never expected UPND to pull such a huge crowd in their own backyard with limited resources compared to PF that has government resources. PF ferried cadres from countryside compared to UPND that only had cadres from Copperbelt & most of them came on their own. In fact ignore even the last two pictures I saw them two days ago. They are from GBM’s Chingola, Chilalabombwe or Mufulira rallies! For a while I though I was the only one noticing that these are the same pictures I saw for Rallies of earlier in the week. But what will be the motive behind posting those pictures? Since when is reporting the truth not enough. Even when he was asking for translation,he asked with alot of force and command ukwabula nensoni,sure a man running for ZAMBIAN presidency failing to say AMATABA,that was an insult to copperbelt. Seems upND has to do a lot of ground work in cb ,if they can get 40% ,that will give them hope , my choice would have been Edith but mathematically she can’t win,so hh seems the nearest person who stands a chance . This bum should learn a final lesson this year, it can damage our economy though it claims to be very educated. I thought the economy is already damaged , seeking IMF help shows the economy is beyond repair , us Africans like doing same things even if they don’t produce any results , it’s not hh who will lose but Zambians , time for change is now. A lot of excitement in the ruling party camp based on pictures coming from the stadium and good for them. A deeper look into the day’s events both in Lusaka and Kitwe would make those who can critically analyse issues, worry for the PF. The President and his party were on the copperbelt and at the same Freedom park less than 2 weeks ago and their crowd then to what the UPND had today should raise alarm bells. You need to understand one thing it is not HH you will teach a lesson but yourselves and your families if you bring back PF for another five years look at the state of the economy people are suffering in Zambia PF has no answers think twice. HH and GBM will nit suffer they have worked hard In life all they do is feel for the poor. I attended the Heroes PF rally and got regular briefings from family and friends who attended and were monitoring the UPND rally in Kitwe. You are at liberty to believe what you want, but the conclusion I have based on these two rallies is that HH is in serious terminal trouble and stands absolutely no chance of winning the August 216 elections. Believe what you want. I rest my case. ARE YOU NOT THE ONE CHEATING YOURSELF? PLEASE CONTINUE AS YOU’RE ENTITLED TO IT. To all PF buffoons like like katondo boys and the dry skull, My president has delivered a 100% workable 10 point plan. Just wait and see, people are hungry and angry. They want to hear a plan that will change their lively wood not sticking to old finished gogos. Where are the young women? Be a little bit civil my dear friend…we don’t have anything against HH…HH is one of us…he is family…he is Zambian and I believe you are Zambian too…so let’s show some respect because you have no idea who Katondo boys is…this is Politics and don’t take things personal….just work hard wherever you are in the diaspora and build a very beautiful house for you and your lovely family back in Zambia and God bless you. Theres no reason in your voice when you start by insulting your fellow citizens your family for that matter. Insulting is a sign of failing to reason sir or madam. Like it has been said HH has all the right to be president of Zambia just like Edgar Lungu. All he needs is to convince more voters. And his supporters should help him to do so but if you his supporters are insulting those who are challenging you then I don’t how you will help bring more numbers on the side of HH. Did HH change clothes at the same rally wearing a red shirt and in picture number 6 a whitish one? So LT you have just confirmed that you are PF. Your propaganda has failed you. You mix pictures from UPND chongwe rally held last week and the mamoth rally held at freedom park today to confusion your gullible PF carders.It wont help you win votes by demeaning attendance at UPND rally. 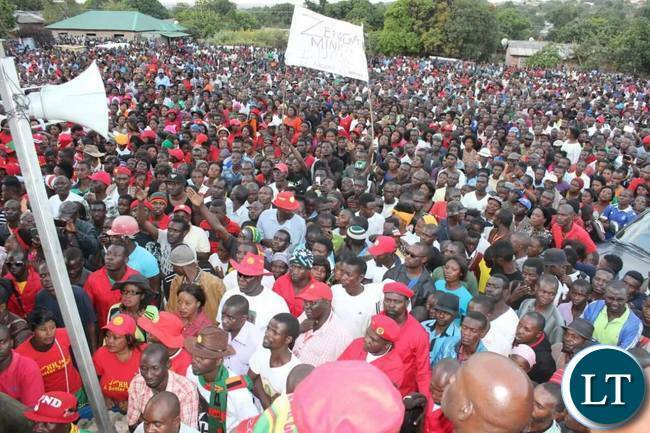 The truth of the matter is that UPND rally in Kitwe today had a record crowd than any other ever held before not even by SATA’s rallies at his peak. Continue deceiving yourself and remember that Kitwe a very strong PF stronghold based on 2011 elections. Clearly your reporting is very un professional and biased. 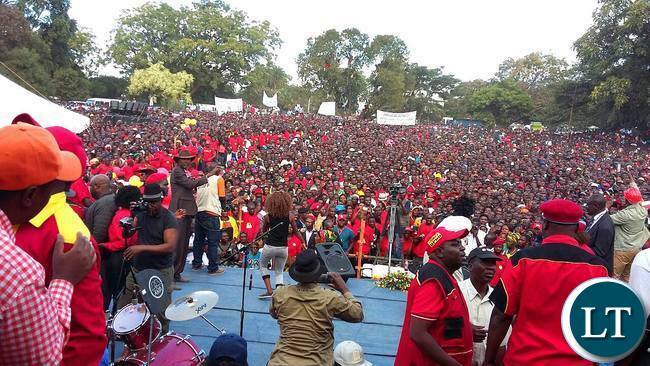 GBM was not at this rally and HH was in red throughout, where are the photos coming from? Ask all upnd dreamers to compare Today’s PF HISTORICAL RALLY WHERE ABOUT 120 000 ATTENDED to theirs in kitwe.CHIEF TRIBAL1ST HH FAILED TO NAME MAIZE IN BEMBA-SEE HOW TRIBAL THIS HH IS! !BEMBA IS SECOND TO ENGLISH IN ZAMBIA,BUT DUE TO HIS HATRED FOR BEMBAS,HH HAS FAILED TO LEARN A SINGLE WORD FROM OUR LANGUAGE-SHAME! !MAY GOD CURSE TRAITORS LIKE GBM,MUTALE NALUMANGO,MULENGA SATA AND MILES SAMPA FOR SUPPORTING HH WHO HATE OUR TRIBE-BEMBA VERY MUCH!! !GOD WILL 100% HEAR OUR PRAYERS BY LETTING EDGAR LUNGU WIN IN 2016 TO FREE US FROM EVIL-HH! !ANYWAY NUMBERS AT HEROES TODAY HAVE REASSURED US THAT PF WILL 100% RETAIN POWER IN 2016!! !”UMUNTU NI LUNGU-2016! !”SONTA APOWABOMBA! !GO PF GO!! Isn’t Lusaka bigger than Kitwe by population? Aren’t Kitwe & Luaska your strongholds? Did the majority of attendees come on their own or were they ferried from outside the provinces? Analyze properly & see who has gained more in terms of attendance! You are the fo’olish tribalist who sees everything tribal about HH. Clearly you are scared of HH for un known reasons.Just chill as he is coming in as your republican President. We dont eat tribalism.What we want is a strong and visionary person to lead this country to development. Why should it be an issue for some one whose mother tongue is another to ask for interpretation. You expect HH to speak fluent Bemba as if it is a qualification to be president, that is why you choose fake characters to lead this country because your standard is totally useless. Id.iotic tribalist, move on swine iwe. CONTINUE CHEATING YOURSELF. THERE’S NOTHING WRONG WITH FEEDING YOURSELF WITH LIES. ITS THE FREEDOM OF EXPRESSION BUT THE TRUTH ALWAYS PREVAILS. Photo number 4 is Julius Malema’s rally in South Africa. From 6 upwards are Chongwe rally. Today we were in red colours, pictures showing white were for 2015 dont cheat people Freedom Park was fully parked.PF kuya bebele. I am shocked that even LT has been bought by PF just like other radio stations. How can you put photos of GBM in Kalulushi and say UPND photos in Kitwe? Photo manipulation is very clear. Pictures from two different rallies were mixed to manipulate the truth. Its shameful and ungodly. Hakainde had two different shirts at the same rally? AWE NAKO KWINE ABANTU EKO BACIBA MWE. TWATASHA. TULELANDA NEFISHINKA MUMA CAMPAIGN NOT UBUFI. I DON’T KNOW WHY I FEEL SORRY FOR UPND BUT ANYWAY FILI EKO TUYA. Photos 1 to 4 are at Freedom Park, the rest are not shame on you Lusaka times for cheating. MUKOSEKO BA uP AnD dOWN. YOUR RALLY HAS DATE-STAMPED THAT COPPER BELT PROVINCE IS FOR PF AS OPPOSED TO WHAT YOU HAVE BEEN CLAIMING IN THE PAST. 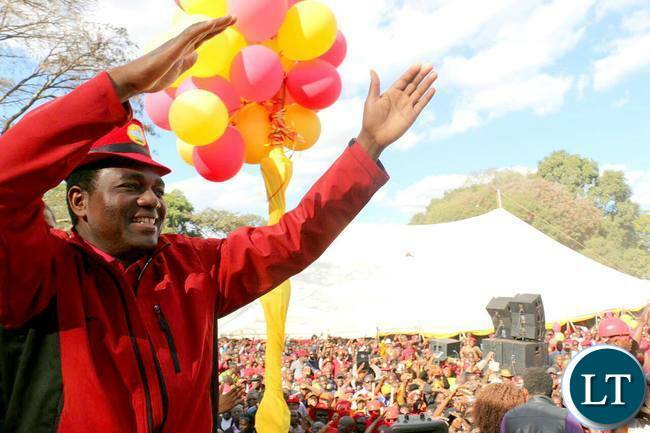 MULI FISUSHI SANA BONSE MWEBACITILE DEFECT TO UPND. YOU HAVE GOT NO BRAINS THEREFORE, NO FORESIGHT. Great Father of glory, pure Father of light, I ask You to destroy all ill spoken words, all ill wishes, all enchantments, all spells, hexes, curses, all witchcraft prayers, psychic prayers, witchcraft spells, voodoo spells, satanic spells, and every idle word spoken against HH and his campaign contrary to God’s original plans and purposes. Lord Jesus, I ask that You destroy the curses associated with these utterances and decree and declare that: they shall not stand; they shall not come to pass; they shall not take root; and their violent verbal dealings are returned to them double-fold according to Isaiah 54:17. Now to the King eternal, immortal, invisible, the only God, be honor and glory forever and ever. Amen. We in the diaspora, God has revealed to us that disaster Stadium was filled by non-Lusaka residents as seen by the accident in Kapiri! condolences to our fellow Zambians being taken for granted and end up traumatized like that! Great North Road was full of minibuses ferrying PF supporters from other towns. Who paid for that? PF is winning big time…Brace yourselves for another 5 years of President Lungu. Next time round, efficiency will be enhanced. This crowd was just “CURIOUS ONLOOKERS”! 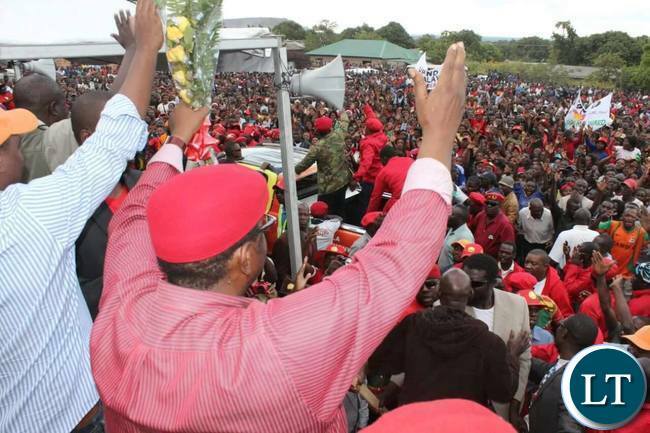 GBM was not at the Kitwe rally! Is it an advanced modern camera which captured him from the police cell and be part of the multitude? I would love to buy such a camera – just late me know the price and source! We have seen blood (Magazi, umulopa) for ourselves. Those looking for satanism proof. See it yourselves.